The D4 ENDEAVOR is an XRD solution for high sample-throughput: it provides optimum performance for online process and quality control in the minerals and mining industries. 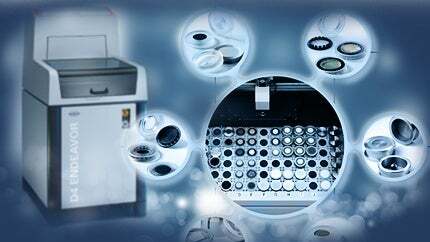 It performs rapid qualitative and quantitative crystalline phase analysis. Top-of-the-range, award-winning software is available for unravelling your minerals’ secrets. The DIFFRAC.SUITE software provide a common look and feel for measurement and analysis software. Powerful tools provide information on the phase content, the phase composition, crystallinity or crystallite size. In combination with the ICDD powder diffraction file, the freely available COD or with a user database, semi-quantitative phase analysis and combined XRD-XRF are available.